Who Is James Mattis, Trump's Defense Secretary Pick? : The Two-Way President-elect Donald Trump has now chosen nominees for nearly half of the Cabinet-level jobs in his incoming administration. President-elect Donald Trump speaks alongside retired Marine Corps Gen. James Mattis after the two met in Bedminster Township, N.J., in late November. At a rally in Cincinnati on Thursday night, President-elect Donald Trump said he would select retired Marine Corps Gen. James Mattis to lead the Defense Department, filling a key role in the incoming administration. Mattis, 66, is famous for both his blunt talk and his engaging leadership in recent U.S. conflicts. Mattis "is the closest thing to Gen. George Patton that we have," Trump told the Ohio crowd. "And it's about time." Mattis had been rumored to be among Trump's top picks for the job — and his selection seemed like a certainty in late November, after retired Army Gen. Jack Keane told NPR that he had declined the president-elect's offer of the secretary post and instead recommended both Mattis and retired Gen. David Petraeus. 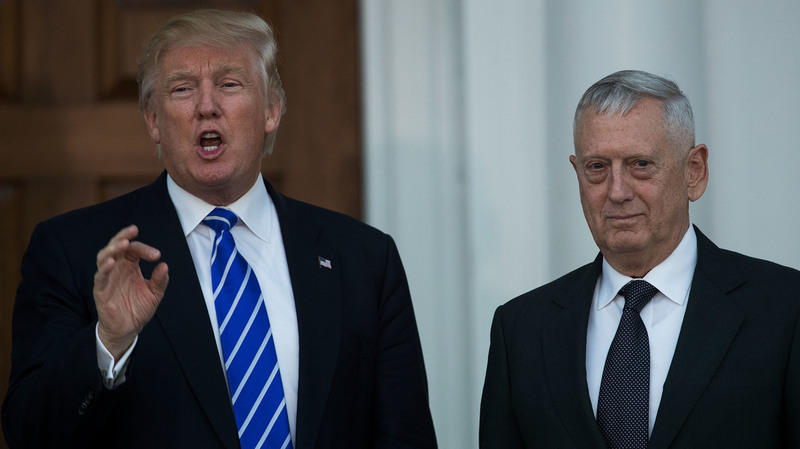 With the choice of Mattis as defense secretary, Trump has now made his choice for nine of 22 Cabinet posts, in addition to two of the seven Cabinet-rank roles (such as incoming Chief of Staff Reince Priebus and U.N. ambassador nominee Nikki Haley). Other recent picks include Steve Mnuchin for Treasury secretary and Wilbur Ross for secretary of commerce. A glimpse of how Mattis, whose nickname is "Mad Dog," sees the current global strategic picture emerged in August, when he warned against U.S. isolationism in a speech to a U.S. Naval War College audience. "The problems that emanate from the Middle East can't be contained in the Middle East," he said. "We know that intellectually, but there's a tendency to want to put a pillow over our heads." From 2010 to 2013, Mattis was the commander of U.S. Central Command, overseeing the wars in Iraq and Afghanistan — a post in which he was Petraeus' successor. The Senate confirmed Mattis to that job despite lingering fallout over a 2005 speech in which he said of fighting the Taliban, "It's fun to shoot some people." "Mattis, a bachelor whom friends call the 'warrior monk' for his devotion to the military, is known to carry books of Roman philosophy with him on every combat mission. He has a personal library of 6,000 books that he insists on taking with him from post to post. But beyond the books and bravado is a general who can connect with his troops." In March 2003, the same month U.S. forces invaded Iraq, Mattis wrote a letter to everyone under his command, encouraging them to think before firing their weapons — and to "Fight with a happy heart and strong spirit. Demonstrate to the world there is no better friend, no worse enemy than a U.S. Marine."